Our client had an existing fence that was 30 years old and had seen better days. It was rotten in many areas, but there was one section that was salvageable. The fence had a unique design and our client wanted to replicate the design on the new sections. We worked with the client to layout the new fence and created a plan to minimize disruption to neighbours property. 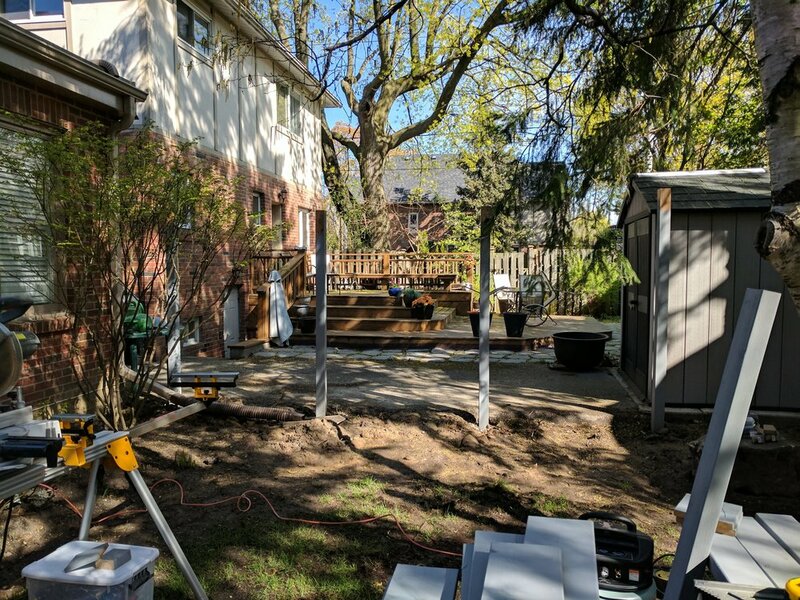 We dug new post holes, custom cut all the wood pieces, fabricated a similar top lattice to the existing section of fence, and painted/stained the entire fence to homogenize the look. The finished product = a beautifully manicured back yard! This section of fence included a custom built gate to match the fence sections joining to the neightbour’s yard. The fence is up, but there’s still some landscaping to do. We worked with the homeowner to ensure that the finished product was just what they were looking for. This section of fence was particularly tricky because it required building around this tree. No problem for us! The posts have been set and we’re ready to start building the sections of fence.